How Should the Modified Sgarbossa Criteria Be Applied Clinically? 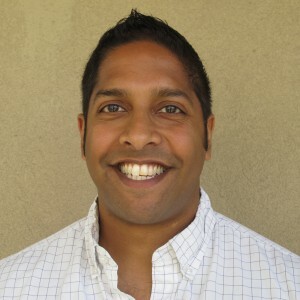 Special thanks to Salim Rezaie for providing expert peer-review for this post. The presence of a left bundle branch block (LBBB) on EKG can make recognition of an acute ST segment elevation myocardial infarction (STEMI) difficult. While a patient with a new or presumed new LBBB and either hemodynamic instability or signs of heart failure should be transferred for percutaneous coronary intervention or coronary artery bypass, patients with chronic LBBB present more challenging decisions. Patients with LBBB tend to have “appropriate discordance” of ST segments and T waves (i.e. ST segments and T waves are typically shifted in a discordant direction at baseline). This has the potential to delay diagnosis and, thus, effect patient outcomes. Understanding the available criteria for making this diagnosis is critical. 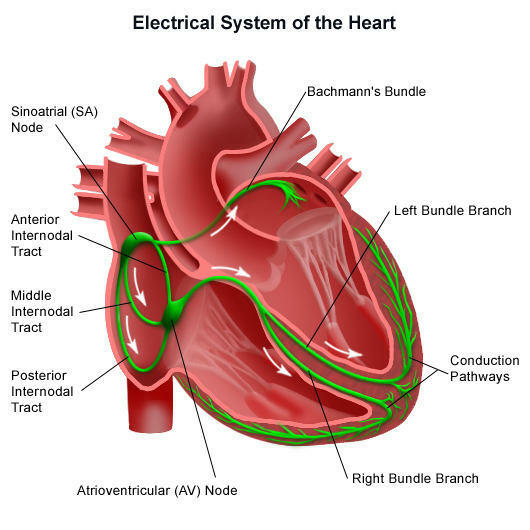 Definition: A LBBB is a cardiac conduction abnormality in which activation of the left ventricle is delayed due to a block in conduction down the left bundle branch. 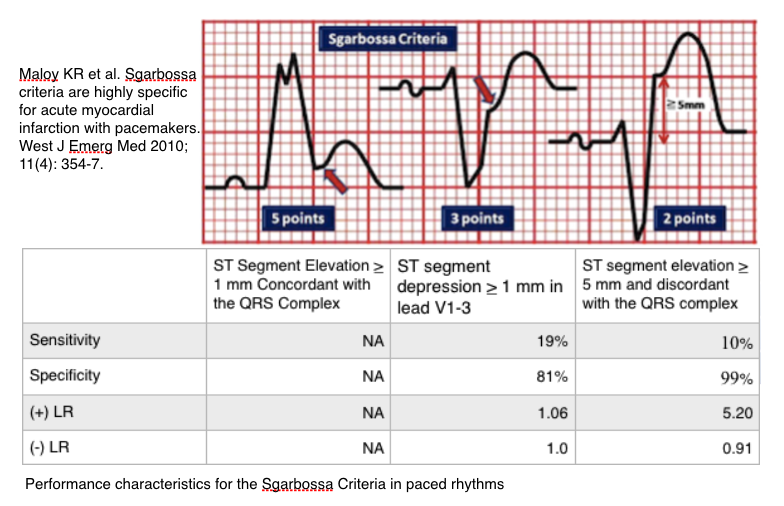 Purpose: The Sgarbossa criteria were created to address the issue of diagnosing STEMI in the presence of a LBBB. At the time of publication of this article, there was no reliable system for doing this. Bottom Line: The original Sgarbossa criteria are fairly good at “ruling in” STEMI in the setting of a LBBB but they are extremely bad at ruling the disease out. Acute myocardial infarction (AMI) was defined as an elevation in CK-MB not by evidence of acute coronary occlusion. This limits the rule’s sensitivity as it groups NSTEMI and STEMI together. Bottom Line: Although the modified Sgarbossa criteria should undergo prospective validation, it seems unlikely that the replacement of absolute discordant elevations with proportional elevations will be less sensitive than the original criteria. 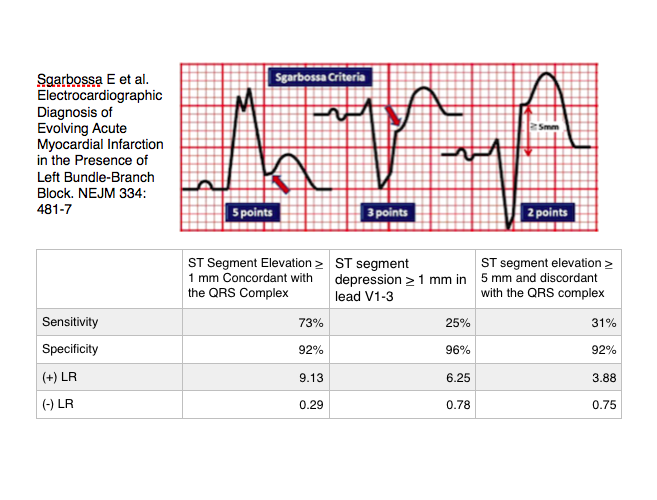 Adoption of this modified Sgarbossa criteria will likely lead to better detection of STEMI in the presence of a LBBB. 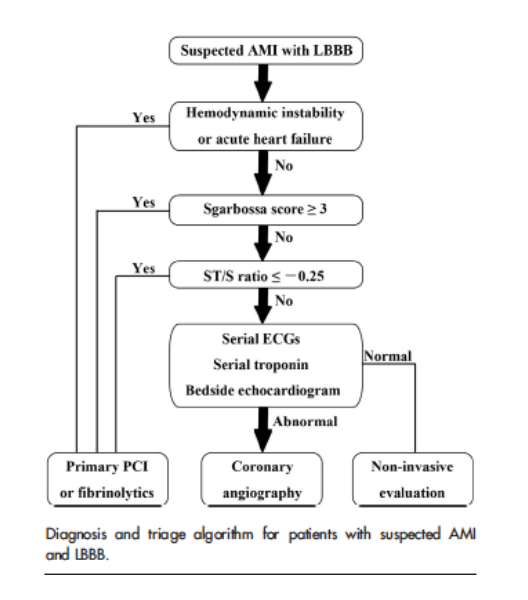 Bottom Line: Sgarbossa criteria are not sensitive for detecting AMI in paced rhythms with LBBB morphology but, the original Sgarbossa criteria 3 appears to be highly specific based on the best available evidence. Detection of an STEMI in patients with an underlying LBBB can be challenging but it is not impossible. 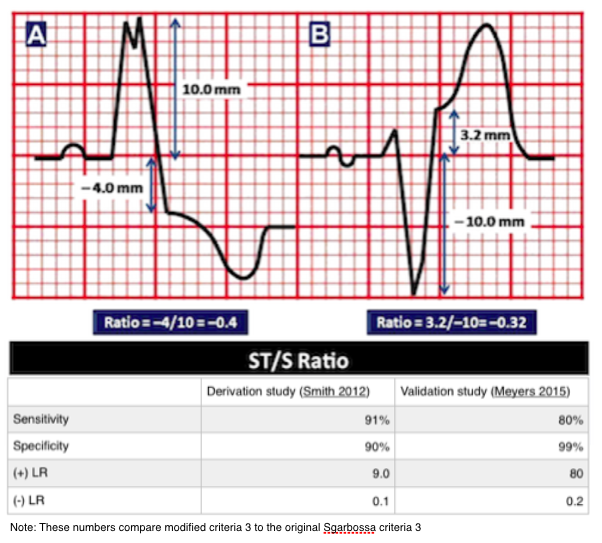 Application of the modified Sgarbossa criteria increases sensitivity of STEMI detection with little loss of specificity and should be incorporated into decision making. There is little guidance on identifying STEMI in paced rhythms with LBBB morphology. If the patient’s symptoms are concerning, consider emergent cardiology consultation regardless of the EKG findings. REBEL EM: Modified Sgarbossa Criteria: Ready for Primetime? This is truly a great post! I have some minor comments. Most of them are nothing important. 1. This sentence: “While a patient with a new or presumed new LBBB and either hemodynamic instability or signs of heart failure should be transferred for percutaneous coronary intervention or coronary artery bypass, patients with chronic LBBB present more challenging decisions.” –> is this in line with ACC/AHA/ESC guidelines? Last time I checked them they did not mention anything about hemodynamics or heart failure symptoms. Good to be sure on this, because it affects management. 2. “Impulses from the AV node spread down the left bundle more rapidly than the right bundle”. –> I’m not sure that it is correct. Transmission speed is equal (4 meters/s) in left and right BBB, which consist of identical fibers. However, the right bundle branch does not give of any Purkinje Fibers until reaching the origin of the anterior papillary muscle (of the right ventricle). 3. “Produces a left axis deviation”. –> If I recall correctly, left ax dev only occurs in 40% of the cases. It is not, however, a criteria. 4. “Broad R waves in the lateral leads (I, aVL, V5-6) that are monophonic” –> the term “monophonic” should perhaps be “monophasic”? 5. This sentence: “There is little guidance on identifying STEMI in paced rhythms with LBBB morphology. If the patient’s symptoms are concerning, consider emergent cardiology consultation regardless of the EKG findings.” –> Might be worth noting that paced rhythms can be checked for ischemia by activating the magnet function. This pauses the pacing and unmasks the intrinsic QRS-ST-T morphology. However the following must be noted: (1) this can not be done in patients who are completely dependent on their pacemaker and (2) the intrinsic QRS-ST-T morphology may show something called “cardiac memory” (or “ST-T memory”), which basically means that the discordance persist for a few hours or even days after shutting off the pacemaker. If you need any figures from http://www.ecgwaves.com please let me know.